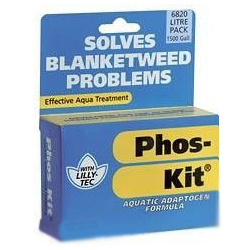 Phos-Kit effectively starves blanket weed of nutrients that is requires to thrive in a pond. Phos-kit is used most effectively after a pond has been treated with Blanc-Kit, to suppress the regrowth of blanket weed. Contains sufficient Phos-Kit to treat 6820 litres (1500 gallons) of pond water.